Most people don’t realize how many of their daily activities rely on a healthy shoulder. However, once an individual begins to have shoulder pain, they realize just how much their shoulder plays a large role in their ability to perform even basic tasks and arm movements. If you are having problems with your shoulder, read on to learn more about what the AC joint is and whether it could be the cause of your shoulder pain. 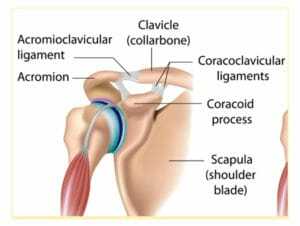 The acromioclavicular or AC joint resides near the top of the shoulder where the clavicle (collarbone) meets the topmost part of the shoulder blade (scapula). This bony protrusion is sometimes referred to as the acromion. Together, the clavicle and the scapula are referred to as the shoulder girdle, which connects to each individual arm. The AC joint is also known as a planar joint because its purpose is to allow a gliding or planar motion in and around the shoulder and arm area. The most common causes of an AC joint issue are a sports injury, repetitive motions or a vehicle accident. The topmost part of the shoulder is heavily involved in sports activities that involving a lot of throwing such as in football or other contact sports. In other cases, individuals can injure their AC joint through a tackle or a direct fall on the outside of their shoulder. Any repetitive movements can also cause overuse of the ligaments at the AC joint, normally helping to minimize movements in joint play, resulting in a sprain of the components making up the AC joint. If the injury to shoulder ligaments is severe enough, the condition is referred to as a separated shoulder. A separated shoulder can also lead to a step-off deformity, which is a bump on the outer part of the shoulder. If left untreated, a separated shoulder can lead to shoulder weakness along with muscle stiffness, greatly reducing the individual’s ability to use their arm and shoulder, even for basic motions. Anyone experiencing shoulder pain should seek prompt medical attention. Generally, an AC joint injury is given a grade, ranging from 1 through 6. 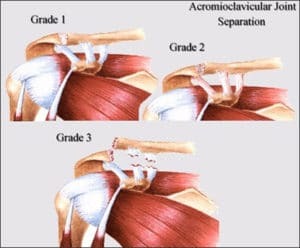 A grade of 1, 2, or 3 is typically a case that is treated with conservative methods such as rest and physical therapy. A particularly stubborn grade 3 case might eventually require surgery if it does not respond to more conservative methods of treatment. In order to arrive at a diagnosis, a medical professional will most likely ask the patient to undergo some manual manipulation testing in the shoulder area. Some of the tests include a shear test, designed to detect abnormal movement throughout the clavicle and scapula area. Another test, the crossover test, is performed by asking the patient to stretch out their arm and then attempting to move it horizontally to the opposite side of their body. For grades 1, 2, and 3, conservative measures include rest of the shoulder and arm, perhaps having the patient initially wear an arm sling or figure 8 harness to facilitate support of the injured area while also allowing it to rest. For the lower grades, a physician will often recommend a series of physical therapy treatments. A professional physical therapist can help reduce the pain level of AC joint patients through the use of deep tissue laser therapy, which can also help to speed the healing process. When a patient is ready, a PT can also instruct their patients through a series of exercises designed to stretch key shoulder and arm muscles, gradually increasing the range of motion in the shoulder area. Lastly, a PT can also recommend strengthening exercises that can help return a patient to their former level of muscle strength. The typical healing time for an AC joint injury that does not require injury is 2-3 months. If you are having shoulder pain and suspect it might stem from your AC joint, please contact Cawley Physical Therapy and Rehab at 570-208-2787 or email us at: cawleyptfrank@gmail.com.